The question “what is success?” is one that crosses all of our minds at some point in our lives. The problem is most people never actually define success for themselves. They spend their lives chasing someone else’s version of success. Our first definition of success comes from our parents. All we want to do is pursue a career that would make them proud. Then, as we hit puberty and progress through high school, success is defined by our peers. We want a career that will impress people, like a doctor or lawyer. Unfortunately, this path only leads to dissatisfaction. If you want to be both successful and fulfilled in life, you have to start by defining success for yourself. The Titanium Success method is built upon you defining your unique version of success. My definition of success and your definition of success will be completely different, and that’s the point. No one else can tell you how to succeed because they don’t define success in the same way as you. Defining success for yourself is an uncomfortable process at first. If you took out a pen and paper right now and tried to define your version of success, you would most likely draw a blank. One thing all successful and fulfilled people have in common is balance. Now, when I talk about balance in life, I don’t mean the modern definition of balance. You aren’t living a balanced life just by doing some yoga a few nights a week and practicing self-care by watching TV instead of doing things you need to get done. 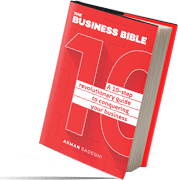 After years of self-experimentation and speaking to hundreds of people through coaching sessions and seminars, I’ve identified the 10 key areas one must focus on to achieve maximum success and satisfaction in life. The wheel uses a simple 1-10 rating system. First, you define what a 10 looks like in each area, and then you give your present self a score using that definition. It’s important to understand that balance is the goal here. I’d rather see you all sixes and sevens than a few nines and the rest are twos and threes. If you want to start thriving and not just surviving in life, you need to understand each area of the wheel requires consistent focus. Let’s break down each area and see where you stand. You’ll need a notebook to write down what a 10 looks like, and then to assign your present self a rating from 1-10. Others think of financial success in terms of savings. They’ll consider themselves successful when they have a certain amount of money in their savings or retirement accounts. The point is we all have a different definition of financial success, and only you can decide which one is right for your life. This section is all about your relationship with your significant other. If you’re already in a relationship, think about the things you need to do to make it perfect. If you aren’t currently in a relationship, think about what your perfect relationship would look like. Your goals for your body will not be the same as mine. Personally, I want the body of an Olympian, and that influences my fitness and nutrition choices. You may not want this type of body, and it’s perfectly fine. The beauty of life is I don’t have to live by your rules and you don’t have to live by mine. If you do need some guidance, though, check out my fitness and nutrition guides. How is your spiritual health? Most people think of spirituality through the lens of organized religion. It’s important to understand you can express your spirituality without subscribing to a specific religion. Your emotional health is your happiness metric. Are you happy and upbeat most of the time, or is there some negative emotions weighing you down? Having high emotional health comes down to having no regrets with how you are living life. Your career is what you do to make money. Your mission is your life purpose. The ultimate goal is to incorporate your life purpose into how you make a living. I own six businesses. I’m passionate about entrepreneurship, but I’m even more passionate about helping people. My drive to help as many people as possible is why I have my Titanium Success coaching and speaking business. If you aren’t giving to something greater than yourself, then you aren’t living to your fullest potential. Some people like to contribute money, and others like to contribute their time. Choose one that works best for you. This is my favorite part of the wheel of life. I work so hard in other areas so I can seek thrills and have exciting adventures with my friends and family. What do you like to do for fun? How are your relationships with your family and friends? Most of our activities for fun and excitement involve our family and friends. Make sure to nourish the relationships with those in your inner circle. Consistent growth is last for a reason. The Titanium Success lifestyle revolves around a focus on consistent growth in the other nine areas of the Titanium Wheel of Life. It’s important to adopt a growth mindset. I do this with a concept called the mobile university. During dead times like commuting or waiting in line, I’m listening to podcasts or audiobooks to improve my life. I’m always learning about tools that I later try out for myself. My philosophy is if you aren’t growing, you’re dying. 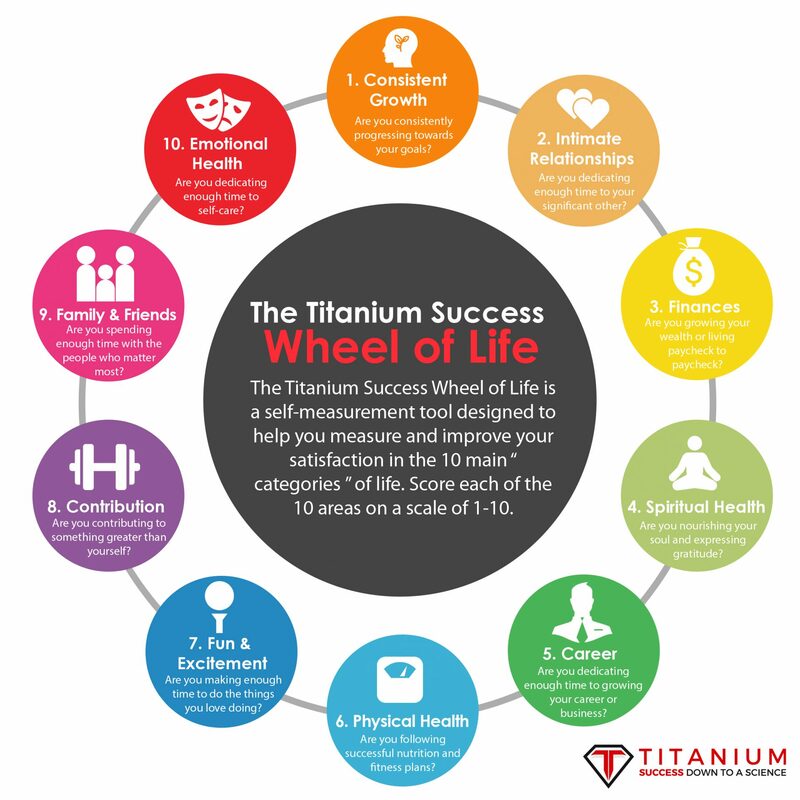 Now that you are familiar with the 10 areas of the Titanium wheel of life, I have a challenge for you. 2 – rate yourself from 1-10 in each area. 3 – Identify your three lowest areas. Once you embrace the Titanium Wheel of Life, you’re ready to inject your both your life and business with rocket fuel. Schedule a free consultation with Titanium Success to learn the important roles non-business areas of your life play in being a badass CEO.